At the Febuary 23 Planning Commission Hearing county regulators vowed to get the Ojai Quarry back up and running. The commission continued the revocation hearing until May 24 while the state conducts its review and county staff tie up loose ends. According to the newspaper, Planning Director Kim Prillhart said "I couldn't be happier with that," and hugged Mosler after the hearing. The California Office of Mine Reclamation (OMR) stepped in after the Ventura County Planning Commission had decided to wait until Febuary 23, 2012 to make a decision. Although the County is giving Mosler two months to try to reach a compromise with County planners, the Ojai Quarry was removed from the state list of approved mines. 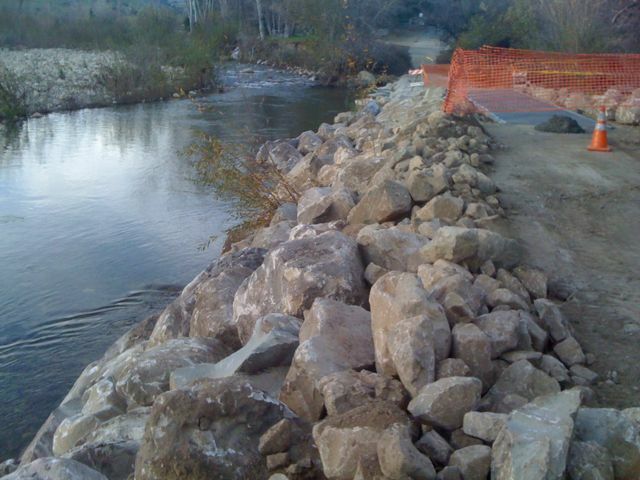 This put County projects on hold, as Matilija rock destined for Callegus Creek was deemed ineligible for public contract. Meanwhile, steelhead and water quality continue to be impacted by runoff from the quarry. Erosion of the steep slope during rain events delivers fine sediment to the creek, which settles out downstream. During a recent survey, several inches of silt could be seen covering the gravel bottom. 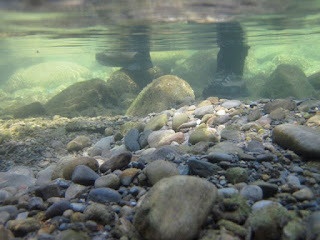 Steelhead spawning 'redds' have been documented in this reach of North Fork Matilija Creek, and the influx of silt can smother eggs and alvein that rely upon the oxygen rich water flowing through the spawning gravel. This past weekend the Ventura Hillsides Conservancy once again hosted the Wild & Scenic Film Festival On Tour! The event held at the Poinsettia Pavilion in Ventura drew hundreds of residents for two evenings of inspired, informative and innovative cinema. The common theme was inspiring activism, and the films highlighted many examples of citizen activists from around the country. Subjects included dam removal and river restoration, as well as the Brower Youth Awards and a film about the successful re-introduction of the bald eagle to our local Channel Islands National Park. This film festival and past Conservancy events are archived here. The final film on Saturday night was 'Release Me,' an independent film produced last summer by a student group through the Blue Horizons Summer Film Program at UCSB. The film has been shown at the Santa Barbara International Film Festival and many other events, promoted heavily by Darryl Mimick, one of the three producers. The film provides a glimpse into the removal of Matilija Dam, a campaign that is now almost two-decades long. The screening was followed by an opportunity for the audience to ask questions of Darryl and Paul Jenkin. 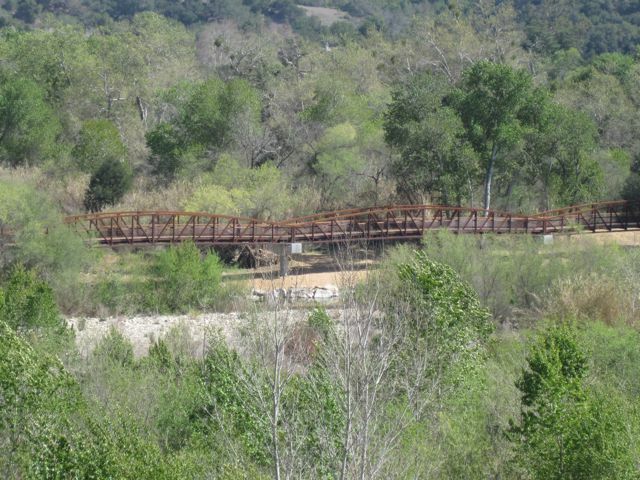 A ribbon cutting ceremony was held this week officially opening the new bike path bridge at the San Antonio Creek confluence. 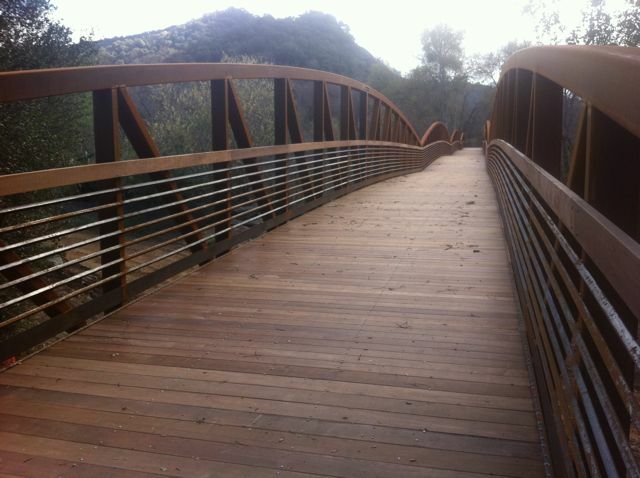 Construction began in September closing this section of the Ojai Valley Trail which runs along the river between Foster Park and the city of Ojai. The project was completed ahead of schedule, re-opening the section of the popular trail. The bridge was designed to span the floodplain, which is very wide in this location. It appears our comments were heard, as the final product is a much longer bridge than originally planned. The work was conducted so as not to disturb the adjacent pool, another concern that we had voiced during environmental review. 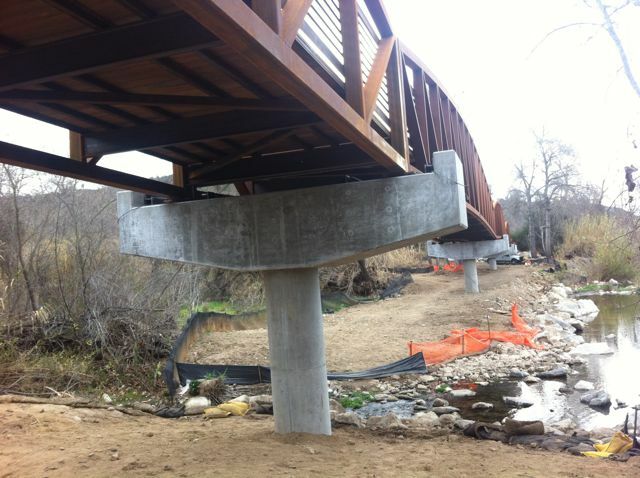 The bridge replaces a concrete culvert that passed low flows but was inundated during storms, preventing bicycle and pedestrian traffic, and also hindering steelhead passage into San Antonio Creek. 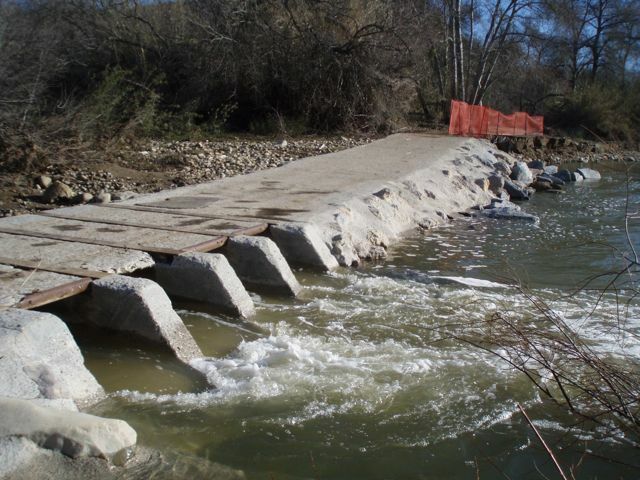 The $1.8 million project was paid for through state and federal grants for fisheries enhancement, as well as $500k from Ventura County Parks. The Channel Islands Bike Club also contributed $17k to the project. The path was damaged during the 2005 floods, necessitating temporary reconstruction and the placement of rip-rap to prevent future streambank erosion. 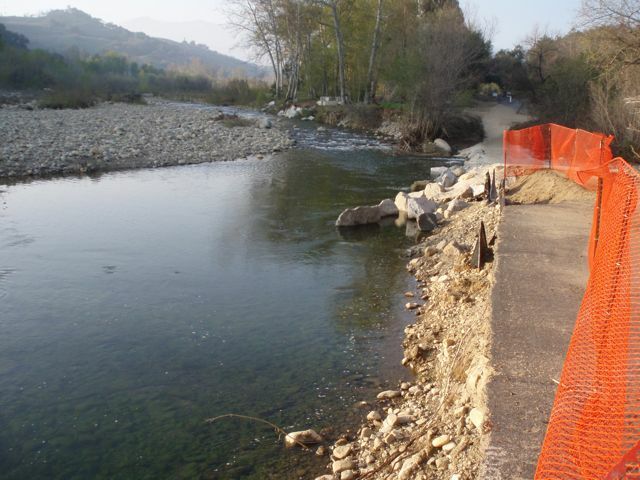 The new bridge will solve this problem, and allow for the natural vegetation to re-establish along this part of the river. Vegetation is important for fish and wildlife as it provides food and cover as well as shade to help keep the water cool in the hot summer months. 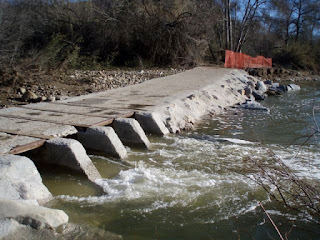 These types of projects, along with larger goals like removing Matilija Dam and restoring instream flows, are identified in the NOAA Steelhead Recovery Plan. And although this expensive project will help the fish, the users of the this river trail will also benefit from an all-weather crossing and the aesthetic appeal of this unique bridge. On this day, two teams of 2 walked both forks of Matilija Creek - the main stem from above the Matilija Dam reservoir to the Forest Service trailhead, and North Fork Matilija Creek from the confluence to Wheeler Gorge Campground. 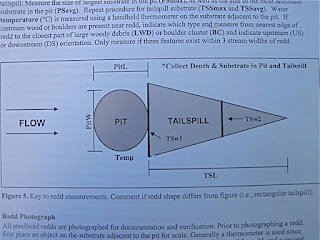 Other reaches of the river, from the rivermouth up, are surveyed on different days of the week, and the whole process is repeated two weeks later. 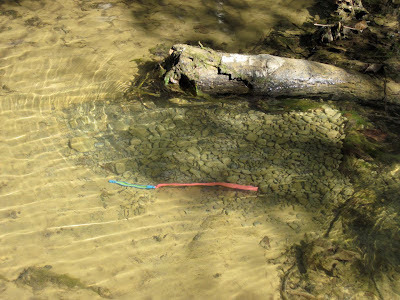 Depending on conditions it takes about 5 hours to wade upstream in the creek looking for 'redds,' so this is no small undertaking. This is an example of a fresh 'redd,' or steelhead nest, in Matilija Creek. 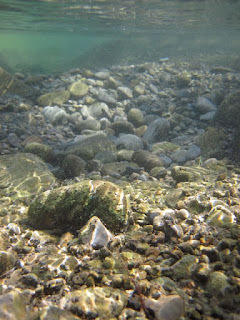 The redds are noticeable as a clear patch of gravel in a riverbed which is otherwise often covered in algae and/or silt. The female fish spends hours fanning the streambed with her tail to create a clean pile of gravel in which to lay her eggs. 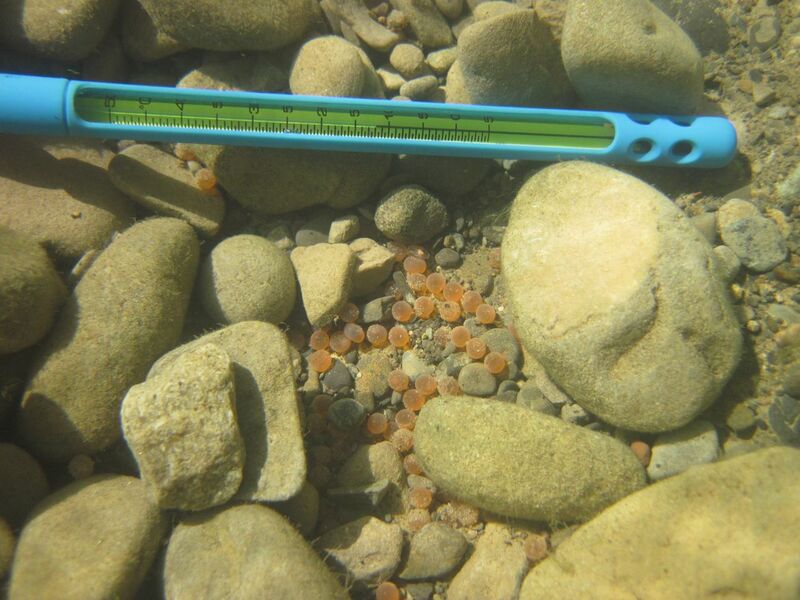 The eggs are fertilized by a male as she lays them, and assuming clear water flows through the redd for the next few weeks, a single redd may produce thousands of alevin which in turn may mature into hundreds of steelhead smolt. 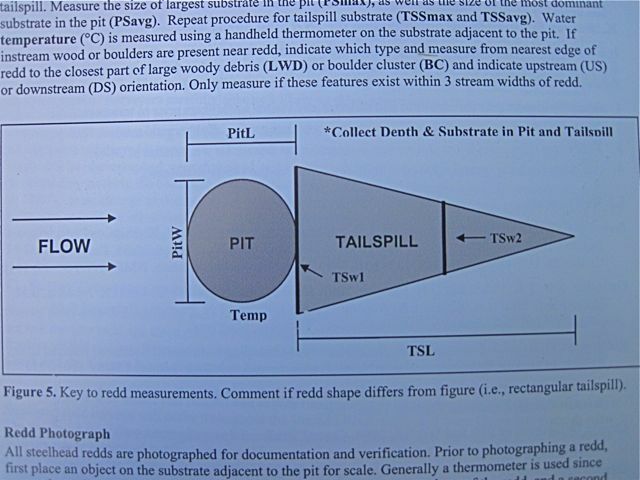 On close inspection the redd may be divided into a 'pit' and a 'tailspill' which are measured and recorded. 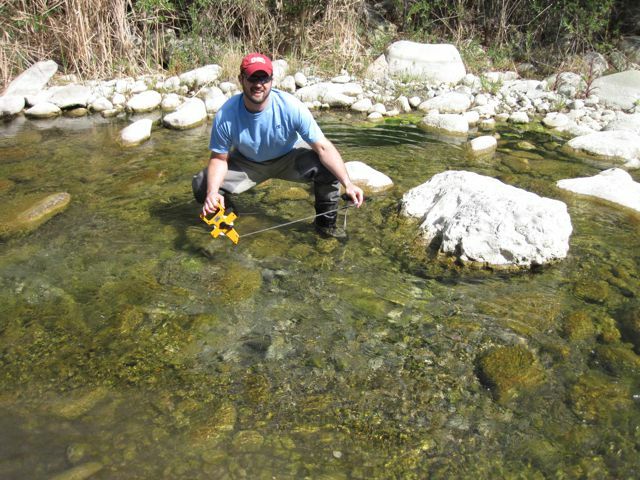 The size of the redd is an indication of the general size class of the spawning fish. 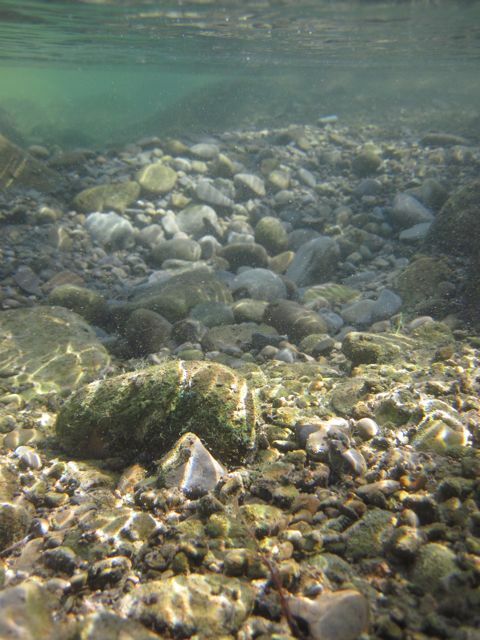 Unlike its more famous family member, the king or chinook salmon, steelhead do not die upon spawning and are capable of returning more than once to spawn or reproduce. Steelhead may also remain resident, as proven by these redds above Matilija Dam, which blocks passage to and from the ocean. 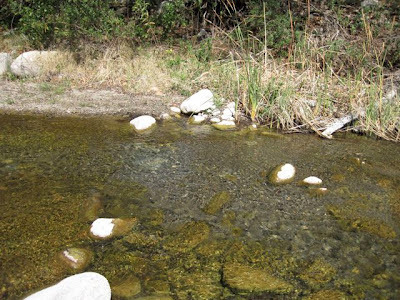 Removal of Matilija Dam would re-establish an ocean run of steelhead, as is a critical part of the long term Steelhead Recovery Plan released last year by NOAA. These types of field surveys are critical to advancing the knowledge of this endangered species, both specific to our watershed, and more generally in the drought-and-flood environment of Southern California.